It is training with a twist. This book is about communication, leadership, teamwork, and fun ways to learn about the roles they play and the impact they have. Inside, you will find easy-to-follow facilitation guides for designing and delivering interactive and innovative training programs that encourage insights, increase learning, develop skills, inspire action, and always create a fun experience. With coaching, it is your time – you decide how to use it. You, of course! 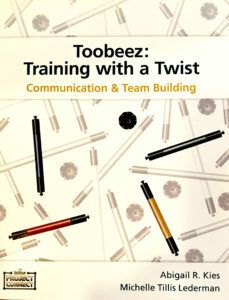 If you are in a Human Resources department, learning & development role, or are an independent corporate trainer, this book is full of ideas for you. Customize on or offsite workshops that incorporate fun with the specific skill development you desire. Includes an Activity Matrix that allows the corporate trainer to focus on specific learning intentions. Steps the trainer through the debrief. Includes teaching notes for 9 games, each with variations and review questions. Play and debrief ranges from 30 minutes to 4 hours.